As Richard guides the cruiser away from the balloon world of Identico, Richard watches as the strange objects shaped like giant numbers approaches the craft, threatening to collide with them. 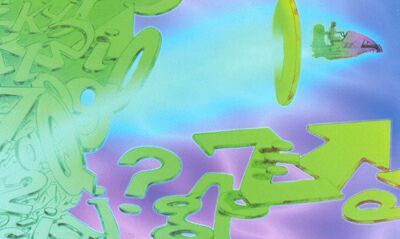 He asks Robo what they are, and Robo responds that they are Teronites, corrupted digitized computer code. Richard asks for clarification, but Robo cannot answer. As the Teronites close in on the cybercruiser, Richard avoids colliding with one and desperately looks for a place to land. He is unable to see anything, but as the Teronites surround the craft he realizes that they have to take a chance. He points the ship down, sending it into a crashing fall. But he spots a landing spot just in time and pulls the cruiser out of its dive. Barely he manages to land the ship on the ground, his heart racing. Disembarking the cruiser, Richard asks Robo if there is any danger nearby. Robo indicates that there is none, but Richard unexpectedly begins to feel drowsy and cannot keep his eyes open. As he ponders this, he suddenly sees something emerge in his field of vision. To his horror, it's the figure of Mortex, the creature he had killed before. 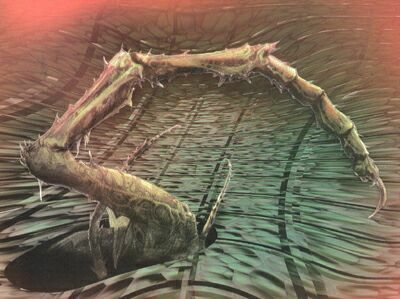 Following closely behind Mortex are two more creatures he had encountered: Tengam and Toxis. He tries to speak, but finds he cannot say anything. 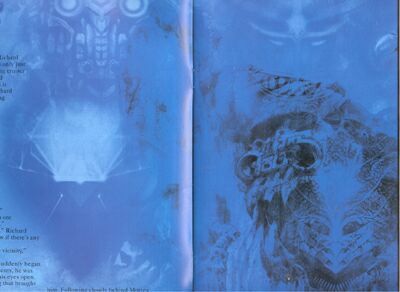 Suddenly, Robo's voice calls out, telling him to snap out of the hypnotic trance of someone called Scoredef. The voice snaps Richard back to his senses, and the apparitions of his foes dissipate. Robo explains to a shaken Richard that the creature called Scoredef was attempting to corrupt his mind with scenes from the past. It is then that Richard hears the distant sound of music, which Robo says is originating from Scoredef. Richard asks Robo just what Scorefed is, but Scoredef arrives swiftly onto the scene before Robo can answer. With the arrival of the giant floating metallic head that is Scoredef, Richard addresses the creature, who speaks in command line code. Robo states that Scoredef is a computer virus in three-dimensional form, designed to corrupt computer systems. Richard suggests a retreat, but Scoredef reacts before they could run. A jet of creamy color liquid is expelled from the virus's mouth and coats Richard's body. Richard tries to move, but finds that the stuff is sticky and is gluing him to the spot. Unable to move, Richard asks Robo for help. Robo's inner components hum and his face panel fires a jet of his perma beam towards Richard. The cold air hardens the gluey stubstance and makes it extremely brittle. Richard moves his body, which causes the glue to crumble all around him. Within minutes he is free of Scoredef's concoction. 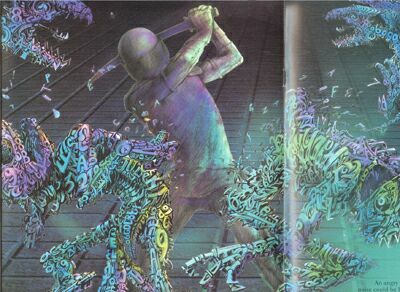 The virus sees Richard's escape and buzzes angrily while mechanically recognizing the error of his attack. Richard, preferring to face the Teronites than the virus, considers heading back to the cruiser. But Scoredef anticipates this. Without warning, Richard hears movement from above and looks up to see a hoard of Teronites descending and heading straight for him. Richard quickly draws his sword and swings at the attacking Teronites, easily swatting them aside. More Teronites try to attack, but Richard's skills in surviving the Ancestral World and Cyber Dimension have allowed him to keep them at bay without worry. Scoredef, realizing the Teronites are no match for Richard, calls off the attack. Scoredef demands Richard's surrender, but Richard defiantly states to the virus that he has seen more worthy adversaries. 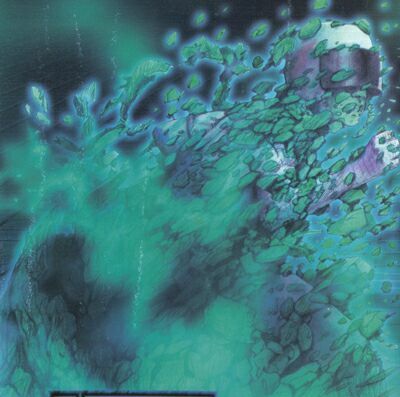 The virus then threatens to destroy Richard's companion Robo, and to prove his power the virus begins to grow in size. Richard quickly moves in between Scoredef and Robo to protect his friend, and then notices a new message has appeared on Robo's binary panel. Thinking quickly, Richard abruptly tells Scoredef that he has surrendered but asks for a moment to say goodbye to Robo. Scoredef grants the request. Richard faces Robo and quickly scans the binary panel before telling Robo to distract Scoredef somehow - a song, a dance, anything. Taking this request literally, Robo moves in front of Scoredef and begins flailing his arms while singing a song composes of digital beeps. Scoredef watches the scene in confusion. As Robo distracts the virus, Richard ponders the binary message before suddenly realizing its meaning. He calls out to Robo and tells him to write a program to cancel out Scoredef. Hearing this, Scoredef realizes the Chosen One had lied to him and begins to grow in size again, eventually reaching twice his original size. Richard prompts Robo to hurry up, but Scoredef reacts first. A bright light blasts from Scoredef and envelops Richard, lifting him off the ground. Then Robo, his processors stretched to the breaking point, suddenly announces the completion of his anti-virus program. The air is filled with a loud electronic static as Robo electronically sends out the anti-virus program in Scoredef's direction. The virus absorbs the program, which Richard at first thinks isn't working. But it doesn't take long for Richard to see Scored begin to shrink, and the virus shrieks loudly in fear as he runs internal diagnostics. 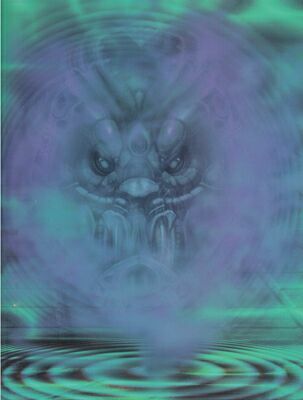 Smoke begins to surround the panicking virus. Suddenly, Scoredef bursts into a bright flash of light and fades away from sight. Before he disappears forever, the virus announces his failure of serving the Evil One. Richard, free from Scoredef's hold, thanks Robo for the quick programming. Just then, he hears the sound of Teronites approaching and urges Robo to head to the cruiser. The pair reach the cybercruiser, but the sky is overrun with Teronites, making it too dangerous to fly. But Richard then notices the creatures are not attacking and are instead forming some kind of shape. He realizes they are forming an arrow and pointing to a large structure that had suddenly appeared in the landscape. Robo explains the Teronites are no longer under Scoredef's control and are now pointing them in the direction of an Omni piece. Robo exits the cybercruiser and heads to the structure, disappearing inside. Moments later, he emerges with the second Omni piece in hand. As Robo returns to the ship, Richard thanks the Teronites and starts the cruiser, asking Robo where to go next. Before Robo could answer, Richard hears a strange sound coming from somewhere in the ground. Robo is unable to tell what the source is due to insufficient data. Suddenly, the ground begins to split and crack open, and Richard sees a giant appendage emerge from one of the holes. To his horror, he recognizes the limb as insect in nature, and as the creature forces itself out of the ground, Richard begins to tremble. 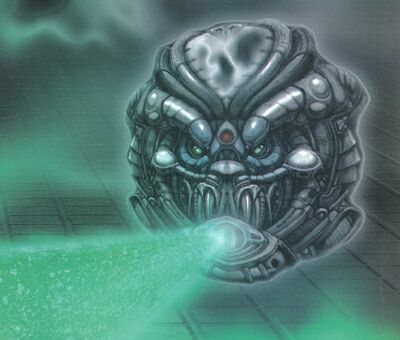 With the thirty-sixth episode of The Ancestral Trail, the second of the MacGuffins of the Cyber Dimension, the Omni pieces, is found after defeating the giant virus Scoredef. Outside of this, there are no major revelations in this issue except perhaps one: Richard's skills. When Scoredef orders the Teronites to attack Richard, he uses the skills and experience he had picked up during his travels to easily defeat them. While previous issues may have brought this up as well (albeit more subtly), it's nice to see Richard's growth over the course of the series acknowledged in this way. This should prove to be useful as the series moves towards its climax in the remaining sixteen issues.